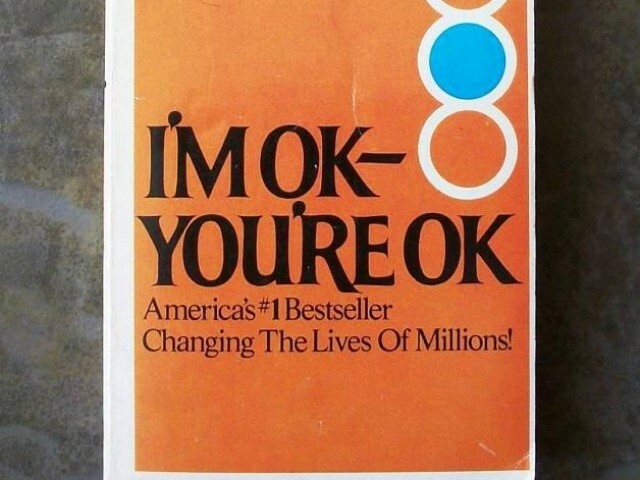 The best-selling self-help book by Thomas A Harris M.D. one realizes how well the theory of the ‘not OK child’ can be applied to a number of Pakistanis (not only as individuals, but as representatives of the nation). Most children initially take the position of” I’m not OK, you’re OK”. They see adults as strong and competent and themselves as weak and prone to making mistakes. As they grow older, some children may take the position of “I’m not OK, you’re not OK” or “I’m OK, you’re not OK” (if abused or mistreated). With the right kind of environment, love and encouragement, some change positions to I’m OK, you’re OK, which is ideal. However, many remain in the first position: “I’m not OK, you’re OK”. This is why they play the game of “mine is better than yours”- my doll is better than yours, my house is bigger than yours and so on – which becomes more sophisticated as they grow up. This game helps them feel better about themselves for a short period of time, though deep down they know that they are still not okay. How does this theory apply to us? Consider the many people who constantly engage in India-bashing. Is this because they are actually better? Do they care about the cause of the Kashmir, Gujarati Muslims or Babri Mosque or are they just trying to hide their own flaws? Even within the country, the same theory can be applied. One ethnicity or sect claims to be better than the other. In reality, the ethnic group wants to establish its superior and the only to do so is by making the others look bad. Some may argue that there is a natural bias or competition with India and among provinces – so why do we spend so much energy bashing the west? Many covetously eye the green card while simultaneously pointing their finger at an adulterous wine-drinking West. Now, with the recent rise in Pakistan-bashing by various local as well as foreign media outlets, Pakistanis (like the abused child) seem to have moved into the position of “I’m not OK, you’re not OK”: I’m not good enough, but neither are you. I cannot accept my flaws without pointing out yours as well. For a change, why not recognize the good in others and ourselves? I’m all for promoting a positive image of Pakistan – highlighting the good aspects of the country like Granta Magazine, a foreign publication, has recently done. But we need to also realize that criticising other nations does not improve our image. Be objective and start questioning the prejudices passed down by our parents. One can consider the possibility that Indians are hard working, that American society has some praise-worthy traits and Pathans are generally quite hospitable. In short, it is alright to encourage socio-political dissent and debate, but one should also look at the positives and at least try to move towards the ideal position: I’m OK and so are you! this passage struck a chord. i’ve seen it happening and may be guilty of partaking as well. but as for criticising, i’m afraid i have to disagree. the people who usually criticise are least concerned with pakistan’s image abroad. we just want to speak up in the hope that things start to change. we’re not going to stay quiet just because it hurts our image. our image has already been shot to hell. forget about image and start working on change! i’d like to believe that we’re okay and everybody else is okay. but we live in pakistan. everything is not okay. telling ourselves otherwise doesn’t help either. sure we’ll feel better, but we won’t magically become okay. hmm….very intriguing…positive and thought provoking post…. @ Alizeh, Yes most things are far from okay. But (1) What we see and hear is not always constructive criticism; often it is based on people’s prejudices rather than facts (2) Like it or not, we do need to work on our image. That does not mean seeing everything via rose-coloured glasses but bringing out and encouraging positive behaviour and achievements rather than glorifying the vices. I agree completely that we should not live in denial. In fact that is one of the points of this piece. We try to deny how irresponsible/bad we are by pointing out the flaws in others. @ Visitor, Yes I have generalized but that doesn’t mean it includes “all” Pakistanis. As an individual yes people have very different, very complicated reasons for behaving in a certain way. But my focus is actually on generalisation – on the way many, if not all, Pakistanis are obsessed with the negatives and use these to see other nations in stereotypical ways. America then becomes the big bad West, India becomes a Hindu-fundamentalist country and so on. The late Thomas Harris was a Navy psychiatrist and a professor at the University of Arkansas. He practiced psychiatry in Sacramento, California and directed the Transactional Analysis Association. Dr. Thomas A. Harris’s pioneering work in Transactional Analysis has had a fundamental impact on our understanding of interpersonal behavior. In showing us how to make the conscious decision I’M OK-YOU’RE OK, he has helped millions of despairing people find the freedom to change, to liberate their ADULT effectiveness, and to achieve joyful intimacy with the people in their lives. Happy childhood” notwithstanding, most of us are living out the NOT OK feelings of a defenseless CHILD wholly dependent on OK others for stroking and care. By the third year of life, says Dr. Harris, most of us have made the unconscious decision I’M NOT OK-YOU’RE OK. This negative Life Position, shared by successful and unsuccessful people alike, contaminates our rational ADULT potential — leaving us vulnerable to the inappropriate, emotional reactions of our CHILD and the uncritically learned behavior programmed into our PARENT. In personal Transactions, NOT OK people resort to harmful withdrawal, rituals, activities, pastimes, and games for getting needed strokes while avoiding painful intimacy with people they see as OK.